Steve Sheppard is the founder of Sheppard Grain Enterprises. He was raised on his family’s dairy and crop farm near Seneca Castle, NY. There he was able to learn about all the aspects of growing field crops, and the importance of using high quality feed ingredients to feed livestock. Steve bought the property where Sheppard Grain Enterprises, LLC. is located in 1982, and built the grain storage capacity up to 900,000 bushels. He designed and built a commercial soybean roasting system in 1988 that utilized most of the soybeans grown in NY for a number of years. The roasting system is now used for processing both GMO and Organic soybeans. In 1999 Steve designed and built a soybean expelling system that is used to produce Organic soybean meal and Organic soybean oil. 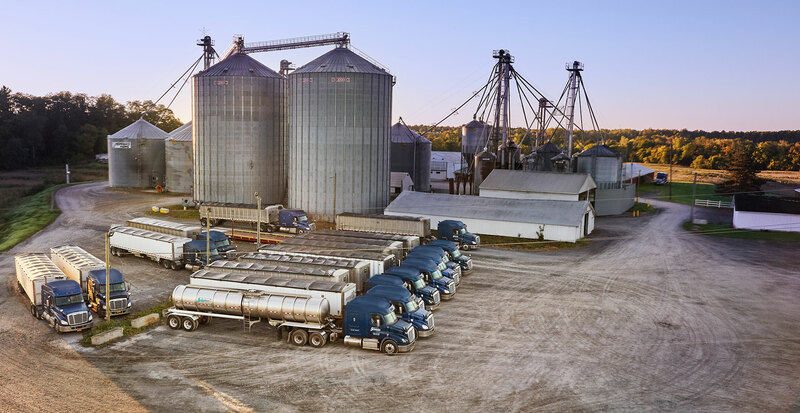 The soybean expeller plant has grown to the capacity of ten tons of meal per hour, making it the largest soybean expelling plant east of the Mississippi. Doug was brought up on his father’s dairy and crop farm near Penn Yan, NY. He began working at Sheppard Grain in 1999 as an operator in the new soybean expeller plant. He then became one of the full time truck drivers for the company. After doing an excellent job at driving truck, Doug was promoted to dispatcher for the twenty tractor trailers that are operated by Sheppard Grain. In 2014, Doug was promoted to General Manager and is responsible for helping with all the functions that take place at the grain facility, and on the road with the trucks. Over the course of Doug’s sixteen years at Sheppard Grain he has been intimately involved in all processing and storage expansions. His experiences in his previous positions help him solve any issues that come up, both in the processing systems, and on the highway with trucks. Tim was raised near Pulaski, NY where his family owned and operated a retail feed and fertilizer business. Following this experience Tim worked as a grain and feed merchandizer for two upstate New York companies. In total Tim has 26 years of experience buying and selling those commodities. Part of Tim’s last job was to develop feed formulas for local dairy farmers. He is knowledgeable in animal nutrition, and the importance of feeding high quality feed ingredients to all animals. Tim came to Sheppard Grain at the beginning of 2016 and is in charge of buying and selling grain, Organic soybeans, Organic soybean oil, and Organic soymeal. He has the authority to write flat priced grain contracts or basis contracts anytime the CBT is open. Tim would be happy to answer any questions you may have on grain, or feed ingredient pricing, whether you are looking to buy from, or sell to Sheppard Grain.